Get a Free Aero3 Milk Frother with Purchase of 25+ Original Coffee Sleeves. See site for details. Get 30% off qualifying coffee machines. Offer is limited to the purchase of up to five qualifying coffee machines per customer during the Offer Period. Black Friday Deals! Get the VertuoPlus Standalone for $99 or VertuoPlus Bundle for $149 + 35% Off All Machines + Free Shipping on $50! Valid while supplies last. 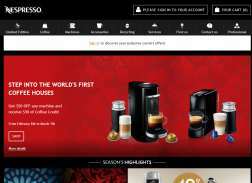 Get 30% off all qualifying nespresso coffee machines. Offer is limited to the purchase of up to 5 qualifying coffee machines per customer during the Offer Period. Void where prohibited or restricted. Complimentary 2 coffee sleeves with purchase 8+ Vertuo sleeves.